​Soil Health is the continued capacity of the soil to function as a vital living ecosystem that sustains plants, animals, and humans. The ground beneath us is alive and it provides the basic functions that produce food and fiber production. Vital soil functions include nutrient cycling, water infiltration and availability, filtering and buffering, physical stability and support, and habitat for biodiversity. 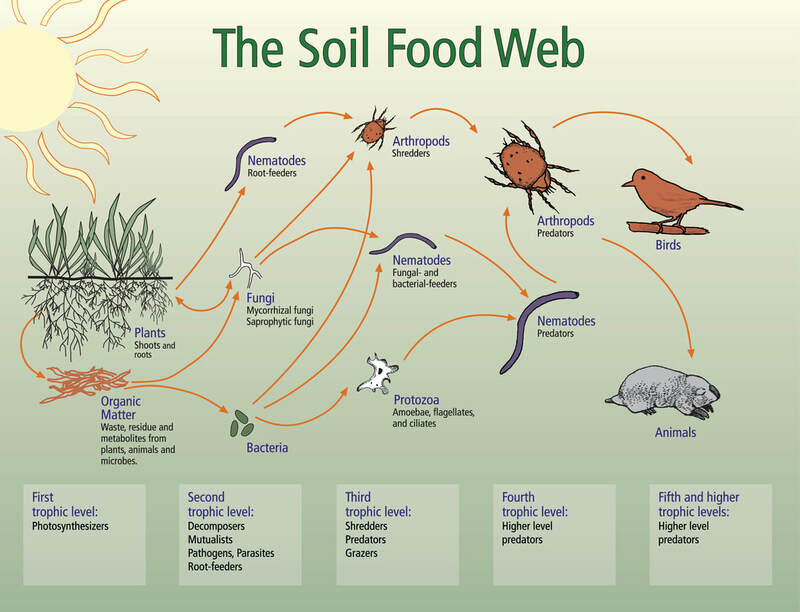 These vital soil functions are a result of the soil food web. Photosynthesis drives the soil food web, which is why above ground land management actions directly impact soil health and its ability function. In a bare ground environment, the soil is in starvation mode with no live root to pump carbon (sugars carbohydrates- plant exudates) into the soil system. No food means little microbial activity and low production of organic matter. Low organic matter reduces the amount of available water for the planned crop, also no cover leads to higher evaporation rates. Bare ground also increases soil temperature, making the soil less hospitable to soil benifical organisms. What are Mycorrhizae, Nematodes, Protozoa, ? ​​Use Web Soil Survey to find more information about the soils on your property. The information provided here gives a brief overview of Web Soil Survey and how to use its tools to find detailed soil information.